Search extension for Magento 2 was launched by Mageplaza is a perfect solution that improves your searching system. Our Search extension brings the most benefits for your customer in terms of finding prefered product. The relevant searching results will be shown immediately after customer enter the first letter of product name. Thus, this extension will help to save your customer’s time, make customer satisfaction and make your sale increase definitely. Mageplaza Search for Magento 2 User Guide will provide the detailed instructions to know How to use on the frontend and How to Configure on the backend. This extension can be used in multiple stores. All stores will be configured under Default Configuration. To change the configuration of each store, admins have to uncheck “Use Website” at the left of each Option. Extension’s configuration in each store will be applied to the selected store. Configuration of this store won’t take impact on the other store’s configuration. 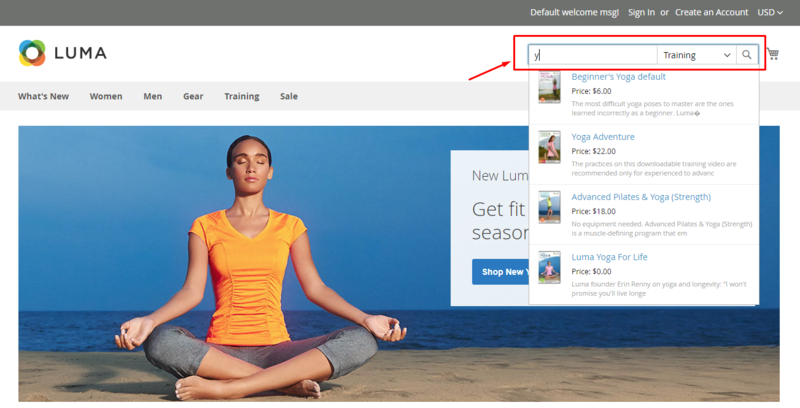 On the frontend, the search box will be shown on the upper-right corner Customers only click on the search box. It will display 10 New Products or Most View Products or Best Seller Product immediately. Customers are able to enter the character of product name on this box to search their prefered product. Depends on the configuration in the backend, the search result will display product name, product thumbnail image, price and short description. The number of search result(s) will be set up in the backend. Customers will click on the result that they are finding, then be redirected to its product page automatically. In Enable field: Select “Yes” to enable this module. Enter the number of search result(s) you want to show in the search result grid. If you leave it blank, the default is 10 results. 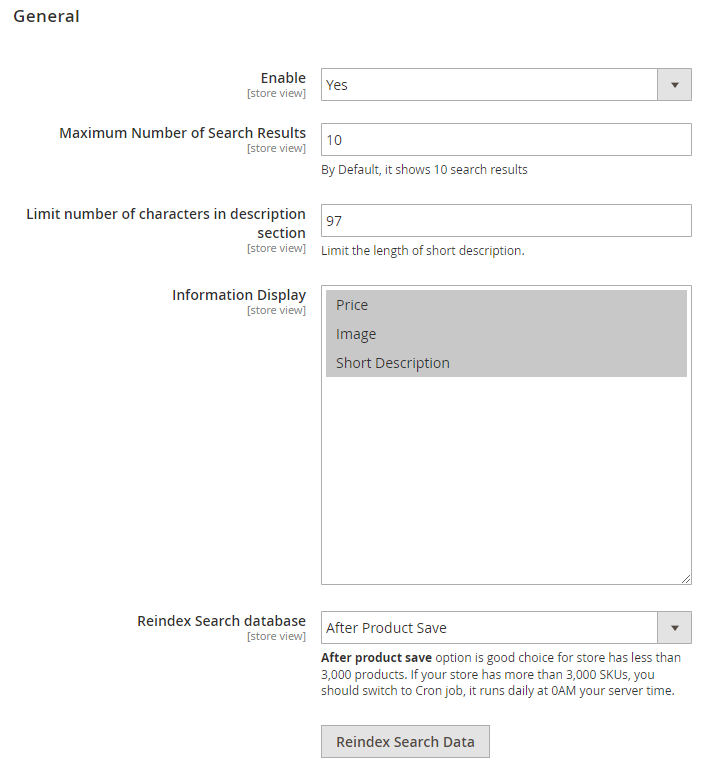 Indicates the maximum character of a product’s short description that display on Search Result pages. After changing this field, remember to click Save COnfig, Reindex Search Data to apply changes on the frontend. In the Information Display field: Chosen information will display on Search Result pages. Cronjob: If your store has more than 3,000 SKUs, you should choose Cron job, it runs daily at 0AM your server time. Manually (used reindex button bellow): You have to click Reindex button everytime product’s information changes. In the Enable Search by Caetgory field: Choose “Yes” to display Category search on the frontend. At that time, Maximal Depth will be shown in the backend. In the Maxiamal Depth field: The entered number represents the level of displayed Category in the search box. In the Enable Search Suggestion field: Choose “Yes” to allow products displaying when customers click on the search box. That’s all about the user guide of Mageplaza Search extension for Magento 2. If you still have any question, please feel free to contact us.